David Garrett has pursued a varied career in studying and teaching history, then as a music administrator and programmer. Currently he combines these two interests in his research and writing about the Australian Broadcasting Commission and music. He has been Administrator of Sydney Phiharmonia Choirs, a programmer and artistic administrator for the ABC and Symphony Australia, and for the Tasmanian Symphony Orchestra. 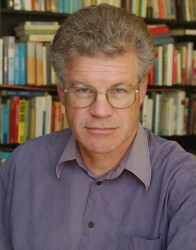 He is one of Australia's leading program note writers and pre-concert speakers. David Garrett' s interest in singing began in childhood in Geneva, Switzerland. He has written about some 80 operas for Opera-Opera Magazine, and lectured for over 25 years for various opera study groups. He has also served as an adjudicator for Symphony Australia's Young Performers Awards and for the Australian Singing Competition. Somewhat belatedly perhaps, but with great pleasure, he has taken up the serious study of singing, as well as continuing to sing in choirs.